Urbana University’s Andrew Tincher (pictured) fired a team-low 79 on Day 2 of the Bill Blazer Memorial. PATASKALA, Ohio – Urbana University men’s golf improved by 39 strokes in the second round of the Bill Blazer Memorial on Saturday, where the Blue Knights finished eighth on the team leaderboard. UU combined to post an overall team score of 705, including a first-round total of 372 and 333 on the final 18. Senior Rodney Howell Jr. led the UU lineup with a 31st-place finish. Howell carded rounds of 86 and 80 for a 36-hole total of 166. Sophomore Kyle Glaser was close behind with a final score of 170 in 38th place. Additionally, junior Andrew Tincher (t-40th) fired a team-low 79 on Day 2 to rebound from a 93 during the opening round. Rounding out the UU lineup were Brandon Davis and T.J. Fink in 55th and 56th place, respectively. Ashland claimed the team title, led by low-medalist Benjamin Jones’ 145. 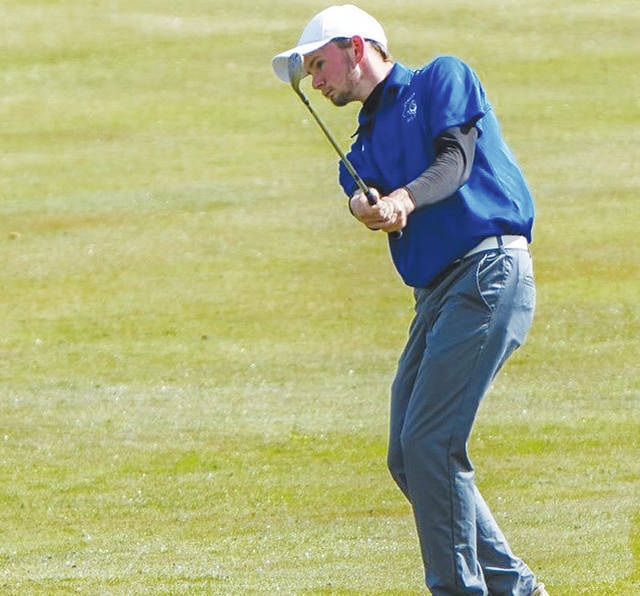 The Eagles posted an overall team score of 615 to edge second-place Malone by two strokes. UU returns to action next Saturday at the Gannon Spring Invitational in Erie, Pennsylvania. https://www.urbanacitizen.com/wp-content/uploads/sites/36/2018/04/web1_uutincher.jpegUrbana University’s Andrew Tincher (pictured) fired a team-low 79 on Day 2 of the Bill Blazer Memorial.